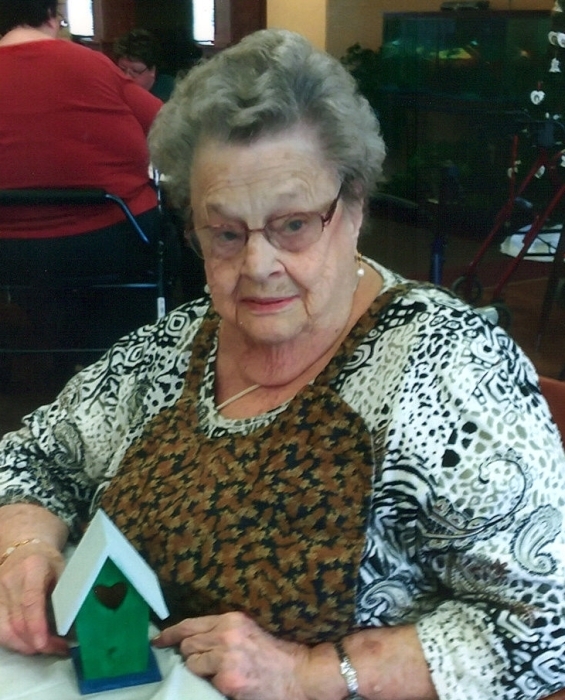 Judy Jensen, age 87, of Spring Valley died Wednesday, March 27, 2019 at Welcome Home Assisted Living in Elmwood. Funeral service is Monday, April 1, 2019 at 11 a.m. at Spring Lake Lutheran Church, rural Spring Valley. Visitation will be on Sunday, March 31, 2019 from 2-6 p.m. at Keehr Funeral Home, Spring Valley and also at church on Monday for one hour prior to the service. Burial will be in Spring Lake Lutheran Cemetery. She was born July 12, 1931 at the Holerud home farm to Herman and Jennie (Formoe) Holerud. She attended the Highland Ridge grade school and Spring Valley High School, graduating in 1950. She was baptized and confirmed at St. John’s Lutheran Church in Spring Valley. On June 10, 1950 she married Lyman Jensen at the Holerud home farm. They raised 6 children on the Jensen home farm. Judy loved going to Birthday Club, gardening, preserving and canning. Later on she loved growing flowers of all kinds. All of you who ever visited her in Elmwood would always find her playing cards somewhere. She also loved bingo, arts and crafts. Judy will be forever remembered by her children: Richard Jensen, Susan (Ralph) Raymo, Donald (Cindy) Jensen of Spring Valley; Julie (Glen) Rasmussen of Roberts; and Karen Wilson of Hayfield, MN; her precious grandchildren: Josh (Kelly) Werner, Nick (Liz) Raymo, Abby Jensen, Brock Jensen, Cole (Kylie) Jensen, Jessica (Issac) Sperstad, and Tyler Rasmussen; great grandchildren: Rodney, Danica, Taylor, Cameryn and Evan; siblings: Lucille Gedatus and Helen Lorentson; sisters-in-law: Virginia Holerud, Rose Holerud, and Mardell Lewis; and many nieces and nephews, other relatives and friends. Judy is preceded in death by her adored husband Lyman; her dear son Roger; daughter-in-law: Nancy Jensen; son-in-law: Chris Wilson; her parents: Herman and Jennie Holerud; siblings: Glen, Raymond, James and Merlin Holerud and Harriette Sorenson; sisters-in-law: Delores Holerud, Shirley Holerud; brothers-in-law: Dale Sorenson, Virgil Gedatus, Wayne Lorentson, and Alfred Lewis Jr.